Most of you know that one of the tricks to sticking to health eating and not getting trapped by fast food or pizza ordering is planning ahead and meal prepping. I typically grill a bunch of meats on the weekends and then use them in different ways throughout the week. The other thing that you may not always think about is to look for ideas that allow you to cook meals pretty much unattended. I’m a big user of the crock pot or slow cooker, but I also try to use my rice steamer or create recipes that involve a lengthy simmer. The slow cooker cooks while I’m not at home obviously, but the rice steamer and simmering allows me to multi-task while dinner is doing its thing. I can squeeze in a quick workout in the backyard or living room, walk the dog, help with homework. All while dinner is in the making. This saves a huge amount of time and still gets a homemade healthy meal on the table. This recipe lets you simmer for 50 minutes and combines two of my favorite flavors – sweet and spicy. Ha, you thought I was going to say beef, didn’t you. Silly, beef isn’t a flavor; it’s an ingredient. 😉 This is a healthier take on a Moroccan dish called tagine. Tagine is actually the type of pot they use to cook it in, thus the dish is named after it. It’s pronounced “tuh-ZHEEN.” Can’t say you didn’t learn anything today. Since they don’t have a lot of water in Morocco, they use dried fruits and pungent spices and cook foods in a covered pot so that it doesn’t require lots of water. Kinda like the Darwin version of cooking. Survival of the fittest cooking technique. I loved the flavors and the textures of this dish and everything came together very well. 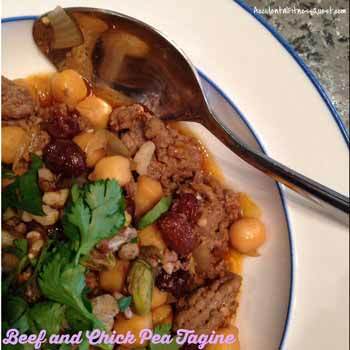 You can use different meats, change the dried fruit, use potatoes instead of chick peas. It’s pretty versatile. Heat a large pan with a lid over medium heat. Add the ground beef and onions and saute over medium heat until the beef is cooked and no longer pink. Break the meat into chunks as you cook it. Add the spices, garlic, tomato paste and honey and cook for another 1 – 2 minutes. Stir in the broth, raisins, and chick peas and bring to a boil. Reduce heat to medium low, cover, and simmer for about 50 minutes. Stir every now and then and make sure the liquid hasn’t boiled off. Remove from heat and divide evenly into bowls. Top with the pistachios and fresh cilantro. Makes 4 servings at approximately 390 calories – 35g protein, 40g carbs, and 10g fat. I saved the leftovers and had them the next couple days for lunch. I think I liked them even better the following days after the flavors sat for a while. It smelled incredible and tasted even more spicy the next day. You can serve this with warm pita bread to soak up the leftover broth or even stuff it in the pita as a filling.